Last year, I collaborated on a project with Saif Sayed, a PhD candidate in Deep Learning & Computer Vision at UTA. He created several visualizations that appeared in my digital book project #TheJayZMixtape published by the University of Illinois Urbana-Champagne’s Publishing Without Walls Digital Publishing Initiative. In 2015, my older brother Professor Howard Rambsy II, and I created a dataset that sought to highlight the ways that Jay-Z signifies on or allude to the works of other artists. We were identifying the relationship between various rap texts, or what literary scholars refer to as intertextuality. 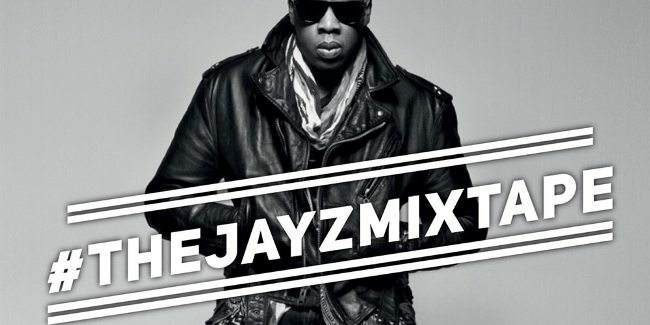 As a lyricist, Jay-Z actively makes allusions, and well beyond what he says, the producers for his music have enriched his sound by drawing on over 600 samples. Just Blaze, Kanye West, Timbaland, The Neptunes, and others reformatted and refashioned already existing songs in order to create new beats for Jay-Z to rap over. In some instances, the producers borrowed lines from other rappers as well as dialogue from films and incorporated them into Jay-Z’s songs. Since I arrived at UTA, I have worked closely with the library’s Director for Research Data Services , Peace Williamson. Last year, I was brainstorming with Peace about ways to take my research on Jay-Z in new directions. Given Peace’s knowledge of my on-going data collection efforts, she suggested I team up with Saif, who was her then graduate research assistant. Saif helped me transform my dataset on Jay-Z into Tableau Public visualizations. The average online reader probably would not find it appealing to scroll through densely populated spreadsheets in order to identify trends in Jay-Z’s music. But an interactive visualization about the rapper’s music might be appealing. The various displays create opportunities to explore and experience different facets of Jay-Z’s first 12 solo albums visually. 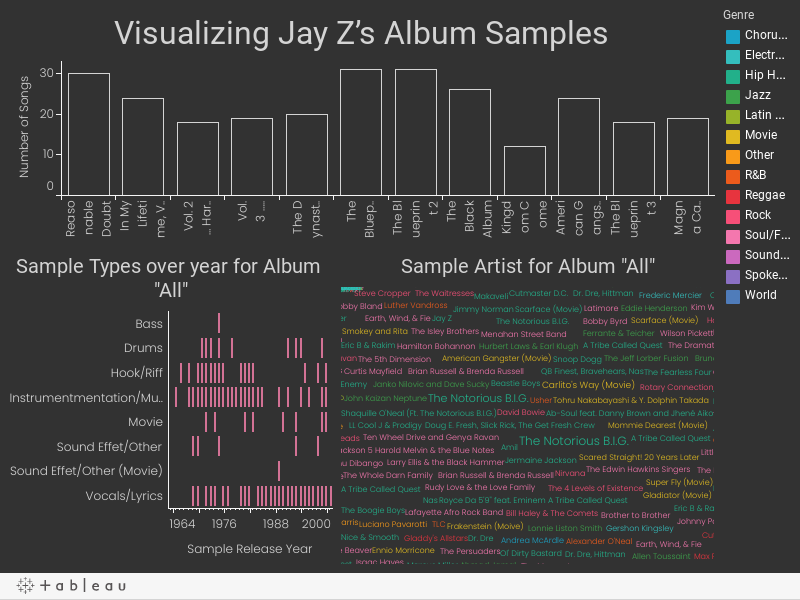 Saif created a visualization that accounted for the extent to which Jay-Z’s producers sample other music and ultimately signifies on other artists. across his first 12 solo albums. Below, I have included one of the infographics. The visualization organizes the information by album, sample genre, or sample artist. Clicking on a particular album reveals the type of sample the album contains in the bottom left hand corner. On the right side, the name of the sampled artist is highlighted. By hovering over the name, you can see the particular song on Jay-Z’s album, the sample song, and release year as well as the sample artist.